Toyota's new RAV4 will be available with a turbo-diesel engine, along with two four-cylinder petrol options. 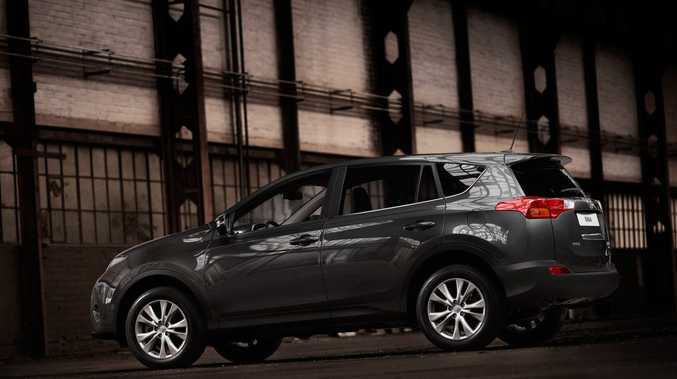 A TURBO-DIESEL will be one of three engines powering Toyota's next-generation RAV4 that will arrive in Australia in the first quarter of 2013. The engine line-up will include two four-cylinder petrol engines as well as the torquey four-cylinder common-rail diesel. Toyota's announcement came today when the new RAV4 was revealed at the Los Angeles International Auto Show. In a significant break with RAV4 heritage, the spare tyre will be placed under the cargo floor and the new tailgate is hinged at the roof. The new 2.2-litre turbo-diesel engine will have an average fuel economy dipping below 6.0 litres/100km and CO2 emissions below 150g/km when mated to a manual transmission. It has a flat torque curve with more than 200Nm available from just above idle and a peak well in excess of 300Nm. The two petrol four-cylinder engines are almost identical to those in the 133kW 2.5-litre Camry Altise and the 102kW 2.0-litre Corolla Ultima sedan. They incorporate Toyota's dual variable valve timing with intelligence (VVT-i) for high performance, good fuel economy, low emissions and smooth, quiet operation. All three engines are mated to six-speed manual transmissions as standard. The 2.2-litre diesel and 2.5-litre petrol engines can be specified with six-speed automatic transmissions while the 2.0-litre engine is available with Toyota's advanced MultiDrive Sport CVT with seven-speed sequential manual mode. Toyota Australia executive director sales and marketing Matthew Callachor said the next-generation RAV4 will be even more capable and flexible to meet the needs of recreational and business users. "The exterior design is particularly striking, with a stronger silhouette that expresses RAV4's inner strength and sporty nature," Mr Callachor said. "It will attract young singles, couples and families looking for a spacious vehicle that accommodates their needs and can be driven on a wide variety of road conditions. "The performance and economy of the three new engines are integral to the overall RAV4 package that includes advances in agility and handling." Toyota said the new RAV4 will include a more advanced all-wheel drive system, a better driving position, improved front and rear vision, and the safety of a more rigid body and seven airbags. "These and other attributes of the next-generation model will expand the appeal of a vehicle that has been a hit in Australia with almost 200,000 sales since the first-generation RAV4 was launched in 1994," Mr Callachor said.